Place: “Melina Merkouri Theater”, Medieval Moat, Medieval City of Rhodes. Click here to see the map. Date: Sunday, 4th of September 2011, at 20:00. 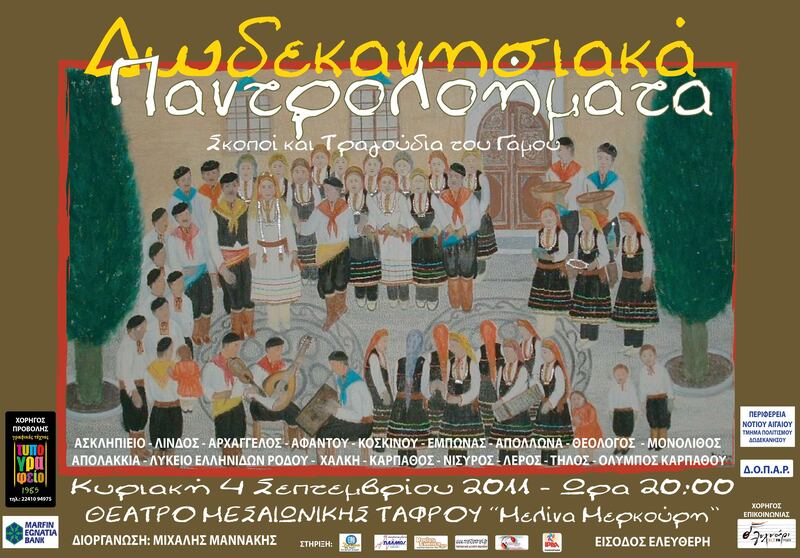 The event is dedicated to the traditional songs that are being sang especially at weddings in Dodecanese islands. 18 performing groups will participate to present the tradition of each island. The wedding songs, with their lyrics, they praise the bride and groom, the parents and relatives of the newlyweds and the best man. The marriage was the biggest event in the society and a lot of people participated in the preparation and the traditional procedures. It will be an experience for the visitors of Rhodes island and a quite happy event for everyone!